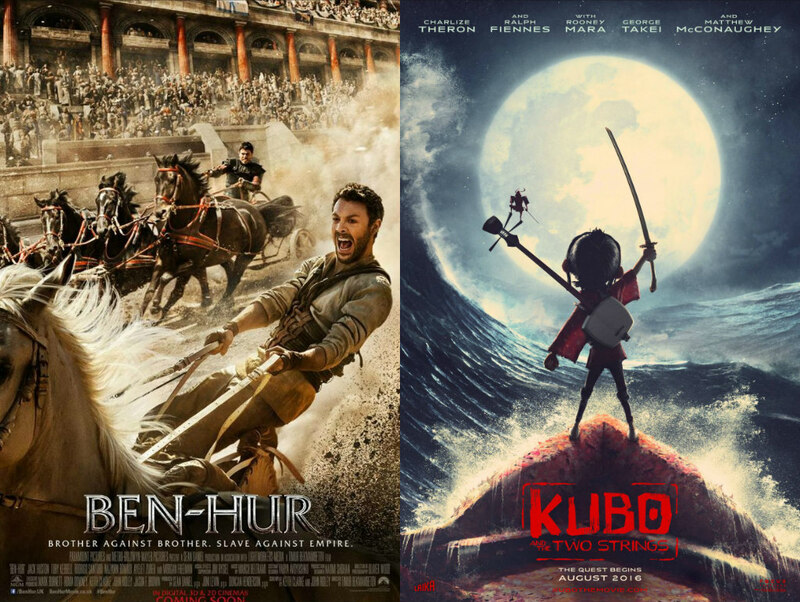 Dearest Blog: Yesterday it was off to the chariot races...erm...off to Marquee Cinemas for Ben-Hur and Kubo and the Two Strings. Spoiler level here will be mild, nothing you wouldn't know from the trailers. First on the docket, the ill-advised remake of Ben-Hur. An exiled prince returns home to seek revenge on the brother who wronged his family. Regular reader(s) may recall that religious-themed movies fall at or about Nicholas Sparks-level on the list of "Things I Endure Only Under Duress." I have no great love for 1959's Ben-Hur, but it's an iconic enough piece of cinema that even I recognized this remake as a bad idea. However, I think any movie with Jack Huston is a very good idea indeed, so I headed out to cheer on my man in his silly chariot race. *sigh* The good news is, while Ben-Hur is far from a great movie, it's not nearly as terrible as I'd feared. Let's get the bad out of the way first, shall we? This remake is a good 90 minutes shorter than its predecessor, but it still goes on a bit. Some of the dialoge is wrong for the characters and/or the time period, and some of it is just plain wrong. The first act features some weirdly awkward time hops, the second act is a criminal waste of Morgan Freeman, and the ending is so cheesy it's almost physically painful, but....... Jack Huston is in nearly every single frame of this picture. I mean, almost every last one. When a guy's the sole reason you plunk down your ten bucks for a ticket, it's hard to complain about a movie that ponies up like that. Huston is a truly great actor and Ben-Hur doesn't come close to giving his talent a workout, but he does as well as anyone could with it. There are some gorgeous costumes and nice looking sets, and the film's sound effects are particularly well done. I'm not a believer, myself, but Jesus (whose appearance amounts to little more than a cameo), provides a timely and important reminder that we have to start being better to each other. Really, people. Finally, if the chariot race is what puts butts in the seats, that sequence is a well-executed nail-biter, even if you already know the outcome. Ben-Hur clocks in at 124 minutes and is rated PG13 for "sequences of violence and disturbing images." Ben-Hur isn't quite the disaster most anticipated, but that's hardly a ringing endorsement. Oh, and, Jack...if the best of your last three movies is Pride and Prejudice and Zombies, it might be time to have a little chat with the agent. Next up: Kubo and the Two Strings. A boy sets out on a quest to find the magical items that will protect him from an old enemy. Kubo and the Two Strings is a gorgeous telling of a gorgeous story. The art and animation are breathtaking and unique, and the tale reflects its culture while being signifcant and relatable to everyone. Big-name voice talent, in the form of Charlize Theron and Matthew McConaughey, adds to the film's appeal, as does a lovely score by Dario Marianelli. (Be sure to stick around for Regina Spektor's haunting cover of "While My Guitar Gently Weeps" over the end credits!) On the downside, the story is a little slow at times, and some parts may be too scary for younger viewers. The 3D is also kind of pointless, so don't waste the extra three bucks if you can avoid it. Kubo and the Two Strings runs 101 minutes and is rated PG for "thematic elements, scary images, action, and peril." 2016 is proving to be a banner year for really great animated offerings, and Kubo and the Two Strings is among the best. Of a possible nine Weasleys, Kubo and the Two Strings gets seven and a half.